Experience true Africa with open air dining and campfires under a crystal clear mountain sky. The Gorillas you will track in Bwindi will belong either one of two 'habituated' family groups, the Mubare Group or the Habinyanja Group. For up to five years, each of these groups have undergone an extremely delicate process that has gradually made them used to the presence of humans, and allowed a few privileged visitors to interact with them briefly in the wild. The Gorillas are by no means tame. They are completely wild animals, which even now tolerate human presence for an hour a day at most. Experienced guides will accompany you on your tracking, many of who have been involved in the habituation process themselves. These guides will brief you in detail on your arrival on the various aspects of 'Gorilla etiquette', but the information contained in this set of guidelines is to help you arrive for your trek well prepared and ready to enjoy this unique opportunity to the full. Gorilla tracking is a year-round activity, with no season as such. The rain forest is moist, and it rains very often in Bwindi, even in the dry season. The trek commences every morning from the park headquarters at 0830 hours. There is a daily maximum of 6 visitors to each Gorilla group, and each group is accompanied by a guide and by porters who will carry your shoulder pack. The Gorillas cover large distances overnight, and they are never constantly in one area. The guides will use their knowledge of the Gorillas' habits and information from the previous day to locate the group's whereabouts. Because of this, the time taken to track the Gorillas varies enormously, from as little as half an hour to as much as 9 hours before one returns to camp. The terrain is extremely difficult, which steep slopes (often steeper than a flight of stairs) covered in dense vegetation that gives the park its name. In addition, the altitude of 5200 feet and more means participants do need to be physically fit to enjoy the track. Once the Gorillas are located, your group will be allowed a maximum of one hour with them. After this, you will return to the park headquarters and your camp. Only persons over the age of 15 are allowed to track the Gorillas. The Gorilla Forest Camp offers a bar and dining cottage overlooking the rain forest, as well as a raised natural platform for open air dining. At night, a traditional African campfire is lit from where a lecture might be given by a visiting primatologist, the Gorilla briefings are undertaken or guests simply admire the myriad brilliance of Bwindi's crystal clear mountain sky. In cases of light aircraft, scheduled flights or private charters, luggage is limited to 12.5 kilos in one soft bag. 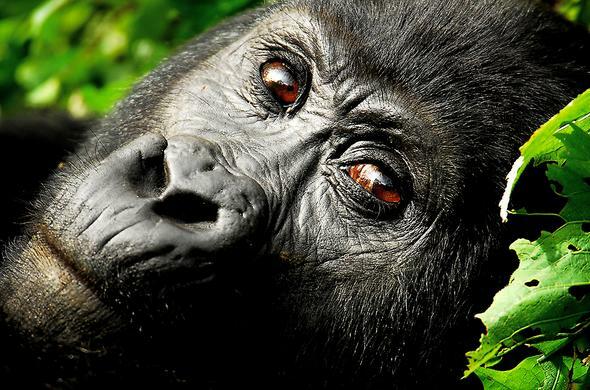 Only 600 of the endangered Mountain Gorilla remain worldwide, and Bwindi National Park is home to just over half of them. Gorilla Forest Camp is situated here. Gorilla Forest Camp in Bwindi Park is the ideal base for tracking of the endangered Mountain Gorilla, and is home to the rare Forest Elephant.